On Thursday’s Mark Levin Show, For the longest time the media, principally CNN, and Rep Adam Schiff told us that then-Candidate Trump knew all about the meeting of Donald Trump Jr. and Paul Manafort with a group of Russians promising dirt on Hillary Clinton. President Trump has maintained that he did not know of any such meeting. 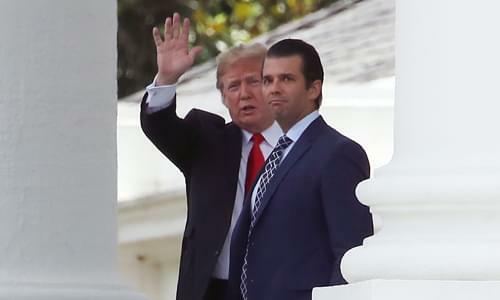 Today CNN contradicted these suspicions as it was confirmed that the President was telling the truth all along and that the mysterious calls made by Trump Jr. to blocked numbers both before and after the meeting the Trump team was lured into. While honest Americans, rely on the press to know about their government, the Democrats use this institution to work as an enemy against We The People! Also, the President is right to question the intelligence community. Russia’s alliance with China against US interests is a cause for concern. Trump’s instincts are spot on. The truth is Trump has been tougher on Iran, Russia, and China than his recent. Later, Senator Warren’s comments on capitalism clearly demonstrate that she doesn’t understand how imposing obstacles and barriers to trade is exactly what strangles the economy. If we’d only have the options to buy what Warren says we can buy; no more choices in shirts, coffee, underwear, or toilet paper because the free market would no longer be free. Beware of the politicians that thrive on government, money, and power, because it’s a matter of time before they regulate how large our homes can be, how much food we can purchase, and what type of energy we use to heat our homes. We’ve seen it already with the left’s “Medicare for all” proposal that would destroy an entire industry while giving us a healthcare system that’s inferior to what we currently have. The left goes after one industry at a time to destroy them; they went after health insurance, next its pharmaceuticals. Yet all the government does is create poverty, the government does not create wealth it only takes it.